Evgeny Bakardzheiv was born on 10 February 1955 in Sofia. His father was repressed after 9 September 1944. He is a graduate in industrial and civil construction engineering. 1984 - 1986 - Head of a "Structures" team. 1986 - 1991 - Chief of a Construction Designer Department in Technostroy. 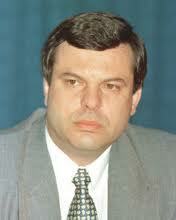 His post 10 November 1989 political career began in the UDF-member BANU led by Georgi Petrov. His first attempt to be elected member of parliament in 1990 failed. 1991 - 1995 - Deputy Mayor for the Izgrev Municipality in Sofia. In this period he maintained close contacts with the then mayor of Sofia Alexander Yanchulev and became member of the board of directors of the Hilton Hotel project, as well as of two other municipal firms. In 1995 he was in charge of Stefan Sofiyanski's mayoral campaign and, following Sofiyanski's victory, was elected Chairman of the Capital City Council; he held this office until 1997. In 1996 he was elected leader of the local UDF party organization in Sofia, later joined the election team of Peter Stoyanov's presidential campaign. After Stoyanov had been elected president, Bakardzhiev declined the post of chief of the President's office, but was elected vice president of the UDF instead. In January - February 1997 he directed UDF's actions staging the protests against the BSP government, and later in April became responsible for UDF's national election campaign. He won a seat in the 38th National Assembly, but took office as the cabinet's number two - Deputy Prime Minister and Minister of Regional Development and Planning. His reputation was one of "the firm hand" in the cabinet. He gained popularity after negotiating with Gazprom the gas supply and transit to Bulgaria. Active supporter of Prime Minister Kostov's idea of transforming the UDF into a party since 1996. Representative of the "third wave" of politicians in the UDF, he is referred to by his friends as "steam-roller", while his BSP enemies call him "fascist". Removed from his positions of deputy prime minister and minister of regional development in December 1999 in connection with Kostov's proposal for structural and personal changes in the UDF government. He returned to Parliament as deputy from Sofia to the 38th National Assembly. Bakardzhiev is Secretary of the Agrarian Democratic Union which joined in late December 1999 the opposition coalition in Bourgas "Alliance for Democracy" formed by the Zhelev-led Liberals, the local UDF founders, who had split from the current Blue administration, and some other organizations. 2001 - Bakardzhiev founded a new political party (Radicals). 2005 - he joined the negotiations initiated by the UDF for united action of the right-wing parties in the forthcoming parliamentary elections. 2007 - his political formation took part in the local elections within the framework of different party coalitions. 2011 - he founded, together with Sofiyanski, Pramatarski, Dilov Jr., a coalition - Alliance of the Democratic Forces (ODS) putting Stefan Sofiyanski up for mayor of Sofia. Entered an alliance with UDF for the presidential election. Married (three times). Speaks English and Russian.